The opinions and testimony of an animal behavior expert may be needed in dog bite lawsuits involving pit bulls or dogs that physically resemble pit bulls. Often, the trier of fact in a civil lawsuit needs to be told about the origins and background of this breed and the supposed propensity of this type of dog for violence. In this post, I briefly review the history of the breed and mention breed-specific legislation that may apply to the breed. I refer to the reader to other areas of this website which cover different aspects of pit bull behavior. The Pitbull terrier is believed to have originated from the cross between the English bulldog and the extinct English smooth terrier. Bulldogs were used in 18th century England for the purpose of bullbaiting: Bulls that were brought to market for slaughter were attacked by Bulldogs who would seize and latch onto the bull’s body. Supposedly, this served to tenderize the bull’s meat. The English savored enjoyment in watching this spectacle. The event drew large crowds until it was realized that too much of cruelty was involved, and the spectacle was banned in 1835. This, however, was the impetus behind the development of the sport of dogfighting. Combat between pairs of dogs was staged in a pit so that eager spectator could watch, wager and enjoy. Pit bulls were well-suited for this endeavor: they possessed superior blood clotting ability, supposedly a high pain tolerance, supposedly a decreased reliance on social signals about their intent to attack (i.e. attack without warning) and supposedly an insensitivity to social signals that normally stop an attack (i.e. failure to respond to submissive gestures). They were also supposedly bred for the trait of “gameness” – a behavioral trait which enables a Pit bull to sustain a fighting spirit despite injury, exhaustion or death. By the time Pit bulls started arriving in the United States in the late 19th century, organized dog fighting was generally outlawed. Nevertheless, some breeders probably make the effort to intentionally select for traits conducive for fighting such as increased size, particularly with regard to the head. The ears were cropped so that they would not be ripped in a fight. In recent years, the Pitbull terriers and other dog breeds mixed with pit bulls, have probably been developed specifically to function as guard dogs. The Pitbull Terrier is recognized by the two major kennel clubs in this country: The United Kennel Club and the American Kennel Club – but under different names. The UKC refers to the breed as the American Pit Bull terrier and the AKC recognizes pit bulls as the American Staffordshire terrier. The difference in the name given to the Pitbull has led to confusion amongst many. 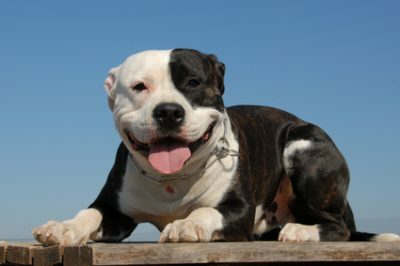 Both the AKC in the UKC varieties are the immediate descendants of the Staffordshire bull terrier, the breed that was developed for dog fighting in England. Behaviorally, nothing in the literature suggests any behavioral differences between these two genetically similar breeds of dog. Accident reports filed routinely by animal control agencies investigating dog bites involving pit bulls, usually identify the dog as being a “Pit bull”. Rarely is specification made as to whether it is the American Pit Bull terrier or American Staffordshire terrier. They are almost always treated as one and the same. This is the convention that will be followed throughout this website, and the term “pit bull” will be used, realizing that there is no such breed as a pit bull per se. Pit bulls weigh between 45 – 80 lbs. Height is approximately 17 – 22 inches at the shoulders. Females are usually smaller than males. Pit bulls have a smooth coat of various colors, the most common being brindle, or white with liver or black patches. The American Pit Bull terrier is about 20% larger than the American Staffordshire terrier. Pit bulls have remarkable strength for their size, a feature which is advantageous for a fighting breed. The breed was officially recognized by the AKC in 1936. Pit bulls were ranked 67th in popularity by the AKC in 2004. No other breed has been maligned or vilified as much as the pit bull terrier. One commonly finds negative publicity about this breed, despite the fact that many honorable Americans have kept pit bulls as pets, including Franklin Roosevelt and Thomas Edison. Consequently, fueled by news reports of pit bull attacks, lawmakers have argued for laws to protect the public from this supposedly inherently dangerous nature of this breed. Breed specific legislation is defined as “any law, ordinance or policy which pertains to a specific dog breed or breeds, but does not affect any others. The term is most commonly used to refer to legal restrictions or prohibitions on the breeding and ownership of certain breeds.” (www.wikipedia.com). 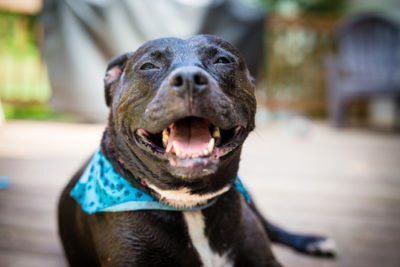 Breed-specific legislation had its beginnings in the United States in the late 1980s, and today, although controversial, BSL has been enacted on a local level in municipalities throughout the United States and Canada. Elsewhere, in countries such as England and Spain, BSL applies on a national level. The legislation is intended to restrict ownership of certain breeds, usually, those breeds that have acquired a reputation for being dangerous in nature. Influential Animal organizations such as the American Kennel Club and the American Veterinary Medical Association adamantly oppose BSL. For example, in the United States, Denver, Colorado restricts ownership of dogs which they consider pit bulls, and a similar law is in force in Ontario, Canada. In England, the so-called Dangerous Dog Act was enacted in 1991, making it illegal to own or maintain several breeds which include, the pit bull terrier. Several major insurance carriers also have “blacklists” of certain breeds; usually included on such lists are pit bulls and Rottweilers, along with several other less popular but supposedly aggressive breeds. Does breed specific legislation effectively protect people from dog attacks? The consensus of most animal behavior experts is that it does not. For example, a recently published study shows that German shepherds, chows, and Jack Russell terriers are overall the most aggressive breeds, and therefore the breed most likely to bite people. In England, there was no substantial change in the frequency of dog bites by pit bull type dogs after the Dangerous Dog Act was initiated. And recently reported results from Spain yielded similar results. At a forum in Denver in 2008, sponsored by The Coalition for Living Safely With Dogs, results were reported from a year-long survey taken throughout Colorado between July 2007 and July 2008. The area surveyed included Denver, a city where ownership of pit bulls is prohibited. Approximately 700,000 dogs were included in the sample, and a total of 2,060 bites were noted, approximately one bite for every 350 dogs, which was less than 1% of the total sample population. Labrador retrievers were the breed most frequently involved in biting incidents, accounting for 13.3% of the total reported bites, followed by pit bulls (8.4%), German shepherds (7.8%), Rottweilers (3.9%), and Chows (3.5%). Note that by chance alone, one would expect higher bite frequencies in labs simply because of their popularity. In contrast, the total population of Chows probably did not represent 3.5% of the sample population, yet this breed accounted for 3.5% of the total reported dog bites, suggesting the frequency of biting in Chows was disproportionately high, yet this breed is not prohibited by breed specific legislation. As far as pit bull type dogs, because of their pervasiveness (for example nationwide they represent approximately 50% of the dogs held in animal shelters), one assumes they represented at least 8% of the total sample population in this survey, therefore findings were consistent with the expectation of pit bull type dogs being involved in approximately 8% of dog bites. The above findings measure the effectiveness of BSL evaluated in terms of frequency of dog bites by breed. However, using this measure by itself should be questioned because proponents argue that one aim of BSL is to reduce the severity of injury when a dog attack happens. In support of this notion, proponents argue that that certain targeted breeds such as pit bull type dogs and Rottweilers, in recent years, have been the breeds disproportionately involved in fatal dog attacks and other research has shown that severe injury is disproportionally high in the targeted breeds. However, non-implicated breeds such as German shepherds, German shepherd mix dogs, and dogs who are mixed breed also frequently cause severe injury. Therefore, proponents argue that to be legally valid, BSL should apply to all large sized dogs, and not just certain targeted breeds. Only when there is sufficient rationale can breeds be targeted through breed specific legislation, and proponents argue that current scientific evidence does not support making this distinction. One must further realize that enacting a blanket ban a particular breed comes at the expense of a substantial portion of individuals within a breed who possess little or no potential to attack a human under any circumstance whatsoever. Is it fair to condemn and restrict ownership of a breed because some individuals within that breed may be inherently dangerous? Are all pit bull terriers inherently dangerous by nature? These are the questions defining the breed specific legislation controversy, and these questions have been addressed, with mixed results, in recent court rulings. For example, in June 2009, the Supreme Court of Canada refused to hear arguments to reverse Ontario’s ban on pit bulls, thus allowing the law to stand. In contrast, in June 2009, the 10th US Circuit Court of Appeals ruled in favor of the plaintiff’ s appeal challenging Denver’s ban on pit bulls, thus allowing the possibility for trial to determine if the plaintiff’s constitutional rights were violated because they owned pit bulls, which violated the law, therefore forcing them to move from Denver. A well-written commentary on pit bulls can be found in the 2015 article “How pit bulls became the bad boys of the dog world” published in the LA Times. An academically and scholarly review from a legal perspective arguing why Breed Specific Legislation is ineffective can be found in the Fordham Law Review. Can a pit bull be accurately identified through physical appearance? Do pit bulls inflict severe dog bite injury at high rates?